Professional tile & grout cleaning service in Sarasota, Fl. An accounting firm located in downtown, Sarasota, Fl was having a problem keeping the tile floors in their bathrooms clean. They always looked dingy. They requested Superior Rapid Response make recommendations to the cleaning service they employ on how to maintain their bathroom floors. The office manger called Superior Rapid Response because we were recommended by a client of the accounting firm as the premier professional tile & grout cleaning service in Sarasota, Fl. A review of the procedure used by the cleaning service to clean the bathroom floors revealed that the cleaners were not rinsing the mops correctly. All they were doing was moving around dirty water. We explained to the cleaning staff the proper procedure to clean tile floors. The main problem with cleaning the floors was solved. Next, we explained to the office manager, that tile & grout are porous substances and over time, dirt is ground deep into the tile & grout. The dirt gets ground so deep into the tile that when the floors are cleaned, as they dry, the ground in dirt rises to the surface. The only way to correct this problem is to professionally clean their tile floors on a regular basis. 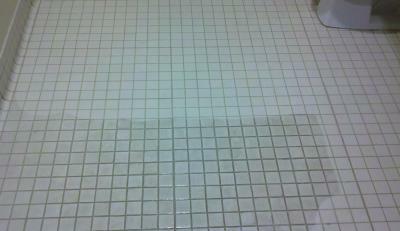 A regular professional tile & grout cleaning combined with proper routine cleaning should correct their problem. The office manager hired Superior Rapid Response to clean the bathroom tile floors and was so happy with the results, that Superior Rapid Response was hired to clean their tile floors and carpets on a yearly basis. Superior Rapid Response is the premier commercial tile & grout cleaning service in Sarasota, FL. Our goal is to offer high quality carpet cleaning and tile & grout cleaning at an affordable price.